In this exercise, you will create a form that will retrieve customer information. You will add a MenuStrip and other controls to this form. Select the File menu, then New, then Project. Make sure (if you are using the Professional Version) that Visual C# and then Windows is selected at the left of the screen under Installed Templates. Name the project and the solution: Customers. Right-click on the project name: Customers. Add the list box and text boxes to the form as shown above. Set the Anchor properties of the text box controls. Test the project confirm that all controls are anchored correctly. Using the Toolbox, add a MenuStrip control. Add a File and a Help menu to the MenuStrip control. In this exercise, you will enhance the customer form by adding a ToolStrip and a ToolTip control. You will also add functionality to the MenuStrip and ToolStrip. Using the Toolbox, add a ToolStrip control. Add 3 buttons to the ToolStrip. Add an About box to the project by right clicking the project name in Solution Explorer. Add ToolTip user assistance by dragging a ToolTip control on to the form designer, then setting the list box’s ToolTip property. In this exercise, you will enhance the customers form to open a second form. You will add container and provider controls to this second form. using the ShowDialog method (modal). as an owned form (non-modal). By adding the apostrophe to the beginning of the sentence, the following text in the sentence is not treated as code by the compiler; it is commented out. For it to compile and execute as code, just remove the apostrophe characters from the sentence. By commented out code you can choose which code you want to have activated in your program. Populate the container controls with further controls. Add an ErrorProvider and HelpProvider control to the form. Configure the ErrorProvider and HelpProvider control to show appropriate messages for associated controls. In this exercise you create a custom text box by inheriting from the text box class. The new text box will convert characters to upper case by overriding the OnTextChanged method. Create a new Windows Class Library project UpperText. Select the Project Menu or right-click the solution name. Make sure the .NET tab is selected and search for the above namespace. Select it and then click ok. Type Imports System.Windows.Forms into the beginning of the Class1.vb file. Rename the Class1.vb file to UpperText.vb. Public Class UpperTextBox Inherits TextBox. 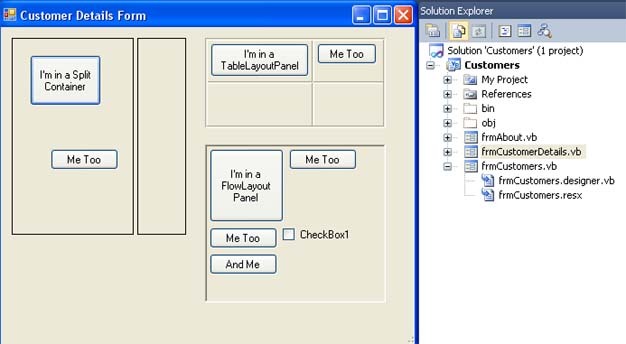 In this exercise you will test the custom text box from a new Windows Application project. Add a Windows Applications project to the solution and call it ControlTester. Set this project as the start-up project. Drag the upper text box from the toolbox to the form designer. Test the control by running the project and typing text in lower case in to the text box. Create a new Windows Applications project in a separate .Net solution. Add the custom text box to the designer toolbox by right clicking, then selecting Choose Items … from the context menu. Browse to the .dll file for the custom text box. Drag the custom text box on to the form and again test the project. In this exercise you create a user control. The control contains three buttons; each will display different product information. Create a new Windows Control Library project called ControlTester. Rename the UserControl1.vb file to ProductDetails.vb. Drag three button from the toolbox on to the user controls designer. Run the project. The user control is shown in a TestContainer dialog box. In this exercise you will test the user control from a new Windows Application project. Right-clicking the solution name: ControlTester. Drag the custom control from the CustomUserControl tab on toolbox to the form designer. Run the project and test the user control by clicking the buttons. In this exercise you will create a custom About Box with an OK button. You will then add another form that inherits from the About Box, but changes the behavior of the button. Create a new Windows Forms Application project called VisualInheritance. Add an About Box to the project called frmBase. Make the scope of the class frmBase public. Customize the About Box with appropriate labels. Add code to the button’s event handler to close the form, make the event handler virtual and have protected scope. Make this form the start up form for the project and test it. Add a second Windows Form to the project called frmInherited. Run the project and test the inherited About Box by clicking the OK button.